Hello everyone! I hope you're enjoying the weekend so far. I don't usually blog on Saturdays, but I decided to join in the weekly recipe linkup at Healthy Living Blogs, where I'm a member. Every Wednesday, a theme is posted, and this week is Fool Proof, Easy Recipes. I have the perfect recipe to share, so I had to join the linkup! I made this recipe for dinner on Tuesday, and it was absolutely delicious and really easy. It took me about 15 minutes to cook and it tasted great! It's also really healthy and filling. What more can you ask for? I found the recipe at 101 Cookbooks, and it's completely customizable. Use whatever you have on hand, and I guarantee it will turn out delicious! How much more fool-proof can you get? 1. Boil 8 oz of pasta. I used whole wheat pasta from Trader Joes, and it took about 10 minutes to cook al dente. 3. Add whatever greens you're using- I used 2 handfuls of Trader Joe's Broccoli Slaw and 3 bunches of kale (tear off the leaves and discard the stems). Add a pinch of sea salt. 4. Cook the greens while stirring for about 5 minutes. The kale should start to soften and get really shiny. I like my vegetables more cooked and really soft, so I let them cook for a while. While they're cooking, whisk together two eggs. 5. Once the vegetables are cooked to your liking, remove about 1/3 from the pot, and set aside. Add the pasta back to the pot, and stir to combine all the ingredients. While it's still hot, slowly add the eggs, stirring constantly. Once all the eggs are added, turn off the burner, and cover the pot so the eggs can cook through. Let it sit for a minute or two, and stir again. 6. 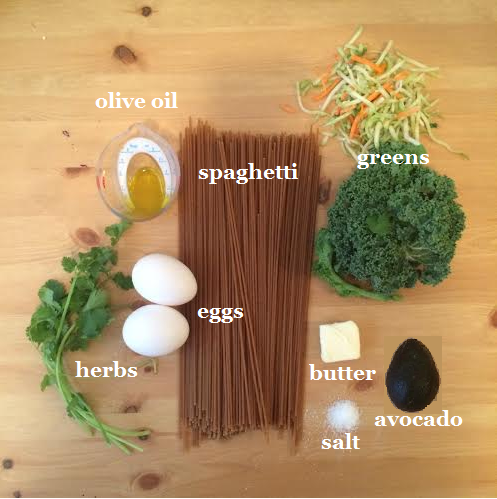 Dish out the pasta, top with some of the reserved vegetables, a sliced avocado, chopped cilantro and basil. Enjoy! This recipe is so delicious and easy to make! I also had some leftovers with sauteed salmon and it was great. I can't wait to play around and try different ingredients! If you try this out, let me know what combinations worked for you! Don't forget to check out the linkup at Healthy Living Blogs to find even more easy recipes!